I first saw the game Kubb [Wikipedia Link] [Kubbin Link] (pronounced k-oo-b) a few years ago and it caught my interest. My interpretation of the game is that it was invented many many years ago by the Vikings in the islands of Sweden. They had time on their hands between raids and needed something to do, sometimes in the middle of winter, sometimes in the middle of summer. They liked the outdoors and had to be mobile, so the game had to work with their lifestyle. All they really had to work with were a bunch of trees so they needed to make a game. Since their main skills were knocking down people with sticks and taking over towns/castles/kingdoms this became the basis for their game. So they found one decently large tree (say 3.5” diameter – a 4×4 from dimensional lumber) and cut off a 12” piece. This would be the “king”. Find a slightly smaller tree (say 2 3/4” diameter – trimmed down 4×4) and cut off 10 pieces (5 per team) and we’ll call these “kubbs”. 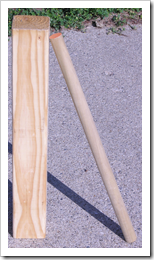 Now we need sticks to throw at them – let’s cut 6 pieces from an even smaller tree (1 1/4” to 1 3/4” diameter). 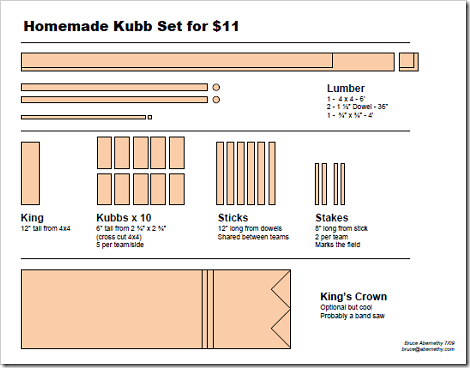 Find a four stakes to mark off the playing area, and we’ve got a Kubb set. 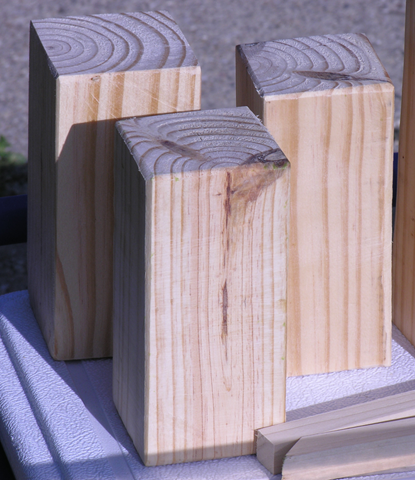 Over the 4th of July weekend I saw a guy selling Kubb sets at a craft show for $45 a set. My first thought was to buy a set, but my second thought was about our new written budget and that wouldn’t work. I looked at the set closely and thought that it wouldn’t take too much effort to make one of these at home. When plans changed for camp this week, I thought it might be a fun activity for us to try to make a set at home. The result was quite successful. Here is a pic and a PDF of the basic instructions for what we did. The first thing to remember is that Kubb sets vary quite a bit. Some use round/cylinder pieces, some use squared off pieces, and the sizes vary quite a bit. Sure there are the World Championship Rules if you want exact dimensions. But since they are in meters, cm and even mm, and my stores (and measuring tape) do not use metric, I used English measurements. My plans (above) are within 97% of the “official” rules and are probably much more practical for home use. A word about which wood to use. 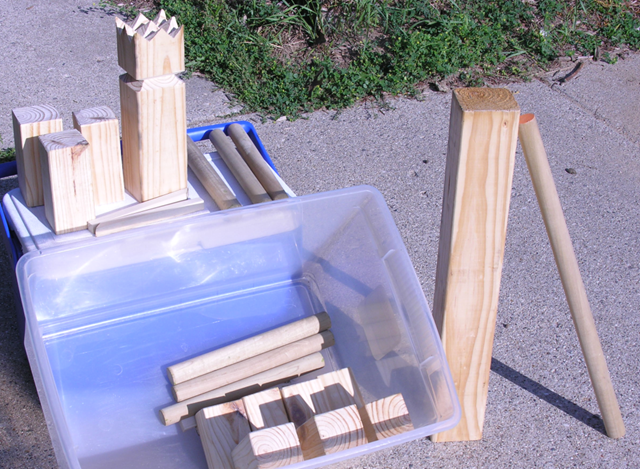 Online and crafty sets come in pine, oak, cedar, ash and even more fancy woods. Pine is the easiest to find, cheapest, and easiest to cut and work with – this is what I picked. After playing a few games you will see that the Kubbs and sticks will get a few small dents and pick up some grass stains. For me this just shows some character and wearing of a fun game and doesn’t impact the play at all – a few “battle scars” make the game even more fun. If this would bug you, buy harder wood and finish with some polyurethane. 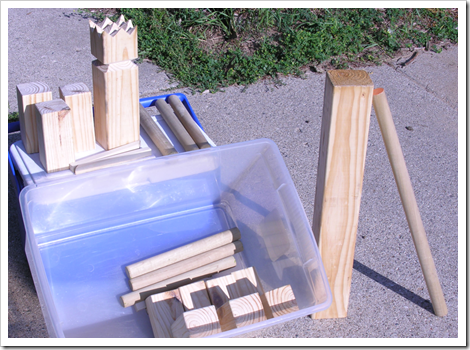 You can make a basic Kubb set with just the wood described in the plans and a miter saw / box. Just cut the King and Kubbs from the 4×4 and cut the dowels to size. 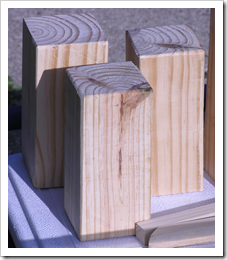 You will have a fully usable and fun Kubb set then with about 20 cuts on the wood you bought home – done. 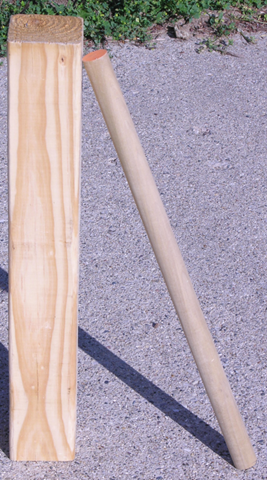 You will need 4 stakes/sticks to mark the corners of the playing area, and you are off. If you want to take it one more step, you can cut down the Kubbs so that they are 2 3/4” x 2 3/4” x 6”. This makes them a little “leaner” than the King. You’ll need a table saw to do this, and of course my simple one will not cut all the way through a 4×4. This ended up being the most work (and mess) of our whole project, and 3 1/2” x 3 1/2” x 6” Kubbs probably work just fine. The final/finishing step is putting a quick crown on the King to make him look a little more important. This could easily be done with some paint or even a Sharpie (or skipped altogether). I cut a double-V on both faces of the top for a simple crown and a little v-shaped notch on each side for the “neck”. We sanded the sides of the Kubbs and sticks as they are handled by the players (don’t want scratches or splinters). We have a bucket that they fit in nicely but I am looking for a canvas or drawstring back to store and transport the set. In the end I am very happy with the result. We’ve played two games and it is quite fun. The rules sound a little complicated to start but after playing through two games we’ve all figured it out. If you search for “Kubb in sand” or even “Kubb in snow” you will actually find results. A fun, outdoor, 4-season game is rare and this is very useful (especially in Michigan). Let me know if you make your own set or think of other ways to customize your set. As luck would have it, when Googling today I found an almost identical set of plans at Instructibles – should have looked there first. It is a little different in places and worth review if you are going forward with your own set.